A few months into my wedding planning process, I fell in love with mercury glass. Also known as silvered glass, mercury glass is a type of decorative glass that's been blown with a double wall, and then filled with a silvering solution and sealed, creating the effect of a layer of reflective silver trapped within the walls of the glass. As the pieces age, the silver within breaks up in bits creating a kind of marbled effect that, with the addition of candlelight, is absolutely dreamy and perfect for entertaining. True mercury glass pieces are expensive, but faux versions are just as beautiful and widely available. I quickly grew obsessed with the idea of having a couple hundred mercury glass votives sparkling around the room and on the dinner tables at our reception. Unfortunately, I found that at 2 to 5 dollars a piece, even the faux versions were out of my decorating budget. I scoured websites looking for tutorials on how to make my own mercury glass, but I was mostly disappointed with the results. The most popular method around the web is one from Martha Stewart, but all the posts I read about it reported less than stellar results. Her method, which calls for spritzing glass pieces with water before spraying with silver mirror paint, results in a streaky mess. Finally, I just devised my own method. 3. Sea sponges. I bought two of these. Available at craft stores and in the bath section of drug and beauty supply stores. In a pinch, you can use a small piece of loofah. Don't use a regular kitchen sponge; you want the irregular natural pattern. Step 1. Prepare your materials: Use scissors to cut a small piece of the sea sponge. Make sure that it is small enough to hold in your fingers and dab inside the votive. Squeeze about a tablespoon each of the black and brown paints onto a plastic plate. This will be your palate. Step 2. 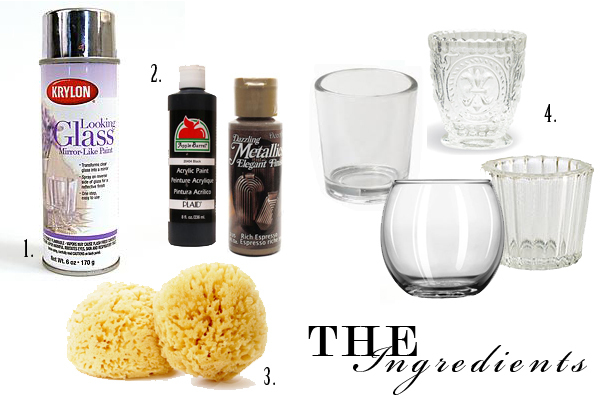 Dab the sponge lightly into the black and brown paint, and then blot gently inside and around the votive. Use a light hand, and only make a few spots in each. You don't want to coat the votive with paint, you just want to make a few smudges on the inside. Repeat with each of the votives and let dry for about 15 minutes. Step 3. Shake the Looking Glass paint well and then, holding one of the votives in one hand, spray quickly and lightly INSIDE the votive. You will be doing a second coat so don't worry if it looks thin. Set the votive aside right side up (the same way you would place it on a table if you were using it), and let it dry. Some paint will pool on the inside bottom, but that's OK. Don't move it around too much to avoid streaks. Repeat with the rest of the votives, then let them all dry about 15 minutes. Repeat with a second coat of paint, then let them all dry overnight. Step 4. If you'd like, you can add a 3rd coat of paint for a more silvered look. Once the votives are completely dry, they're ready to use! I used these with real candles at my wedding, scattered along the dinner tables and on many other surfaces around the room. When the candle is lit, the flame gives the glass a warm antique glow. 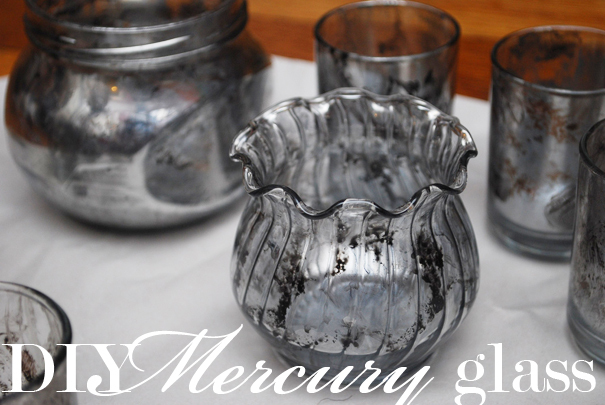 The same antiqued mercury glass effect for a mere fraction of the price! NOTE: This technique also works well on clear glass vases to make gorgeous and inexpensive wedding centerpieces, but if you plan to fill with water, use another vessel or liner on the inside to hold the water as the paint is not waterproof. Note that this is also not food-safe, so you'll also need a liner if you want to use for a fruit bowl or other similar purpose. Once completely dry, it IS safe to use with real candles.